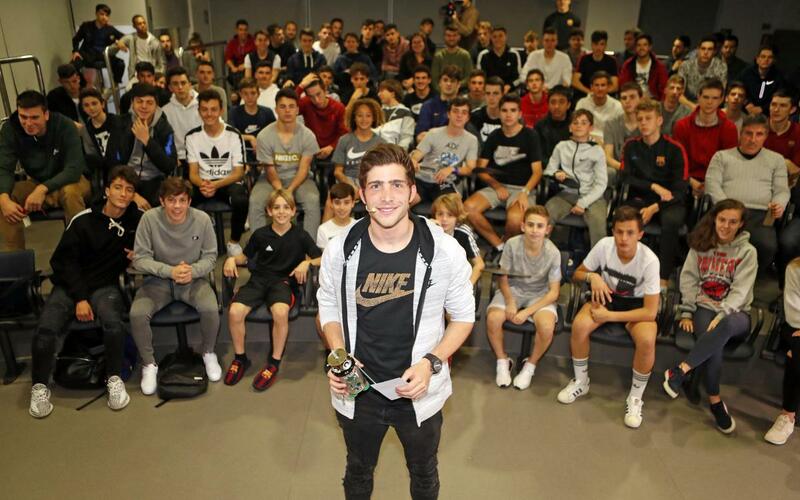 "I recommend that all the young people of La Masia enjoy this moment because they are privileged. Millions of children would want to be in their situation." A statement from Sergi Roberto designed to encourage the residents of FC Barcelona’s academy at a conference that the Blaugrana attended this Friday under the leadership of the Masia 360 programme director, Carles Folguera, and Barça TV journalist, Jaume Marcet. Consistency and work were the other concepts highlighted by the player: "The most important thing is to always work to the maximum, even if you’re not called into the Matchday squad. Each moment is an opportunity to continue improving. You need to be ready for when an opportunity arises, and then to make the most of it." Finally, he referred to dealing with criticism: "The best thing is to not allow the criticism to affect you in the bad times and not to get too carried away with praise during the good times. The most important thing is for your colleagues to value your work."